FREE kids music can be found everywhere around your home these days. Childrens TV for a start. Many toddler TV programs have sing and dance along sessions. Also you can get free kids music downloads from numerous wesites. ........................Simply do an internet search to find some that you like. 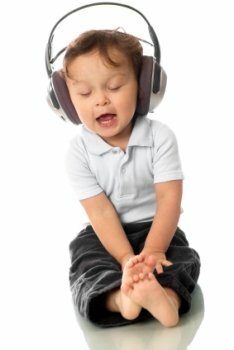 You probably won't be suprised to learn that music is a major factor in your little ones early child development. It helps with many areas because the inner ear is responsible co-ordination and balance. Listening to music with a beat helps make them more co-ordinated over a period of time. Kids really enjoy things like dancing and clapping in time to the music. They also from a very early age love to use rattles or bang on things to create music (noise to us at times). You can make simple toddler musical instruments together with your toddler from every day items. Save some small plastic bottles as you can fill these with dried rice or past shells. Both of these will make a different sound. Then there is the old favourite "pans and a wooden spoon" (for as long as you can stand the noise). music games for kids can be a perfect way to make music activities for kids. You can play the old time favorite pass the parcel to music. You can play musical statues and another old timer is musical bumps or musical cushions as I call it. Take a look here to find out more about these toddler games. kids christmas carols are another perfect way to introduce kids to toddler misic and singing. They just love getting involved with all things to do with Christmas. There is nothing more heart warming than seeing your toddler singing in the Kindergarden or nursery carol concert. Take a look at this short video showing a cute little girl singing "Twinkle twinkle little star" you will love it. This is great fun and a great toddler learning activity.